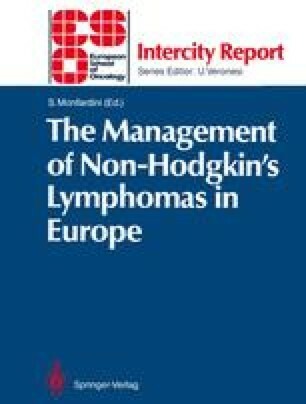 The fourth Intercity Meeting of the European School of Oncology on non-Hodgkin’s lymphoma, chaired by Professor Gösta Gahrton, was held at Huddinge Hospital on 3rd June, 1988. The purpose of the meeting was to present and challenge current treatment strategies in Scandinavia, the United Kingdom and the Netherlands. The discussion was based on the following papers: “Critical analysis of pretreatment staging in non-Hodgkin’s lymphoma” (Öst), “High-grade malignant non-Hodgkin’s lymphoma in Norway. Treatment and clinical aspects” (Abrahamsen), “EORTC studies in malignant lymphoma” (Somers), “Management of high-grade malignant non-Hodgkin’s lymphoma. Report from a Swedish multi-centre study” (Cavallin-Ståhl), “Biological tumour progression in low-grade malignant non-Hodgkin’s lymphoma” (Nissen), “Management of follicular lymphoma” (Lister), and “Bone marrow transplantation in non-Hodgkin’s lymphoma” (Goldstone).